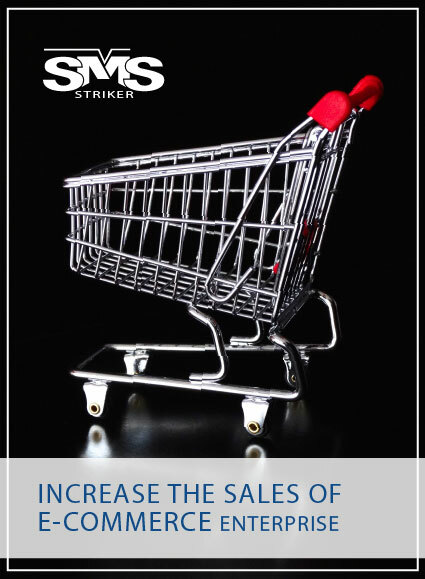 Learn how SMS Striker helped to increase the sales of E-commerce Enterprise. Our client is one of the major e-commerce enterprises that sells more than one million products in a month via online and it is one of the fastest growing ecommerce businesses over last four years. The main goals and challenges of our e-commerce client were to promote communication between seller and the buyer as the timely update will promote trust and coordination. It is vital to communicate to the buyer the shipping status. They needed end-to-end SMS which included verification, confirmation, payment reminders, feedback and to promote their products. SMS Striker makes it simple to enrich your customers shopping experience in a more pleasant way. SMS Striker provides comprehensive and holistic services and other related text messaging solutions to Ecommerce companies that enable enterprises to communicate with their customers with lot of ease. Based on the needs and requirements, following are the SMS Services that SMS Striker has provided. SMS with Short URL for payment reminders as well as to promote products with offers. Undoubtedly, Ecommerce has revolutionised the buying and selling of products online in just a simple way. When it is a matter of SMS services for E-commerce enterprises, SMS Striker is a one-stop end to end solution. Our instant SMS services enable you to reach to your target and large customer globally, with round the clock expert and experienced support. SMS notifications help in providing superior customer experience. Any updates and instant communication when provided to your customers helps in builds deep loyalty, trust and helps in customer return rate.